Shya, Will You Ever Be a Mensch? It was 1957, I was 16 years old and struggling. A troubled teenager, I was dyslexic and could hardly read. Somehow, I eventually managed to make it through high school and go on to get a college degree, but at that time, my fate was quite uncertain. It was hard to know how I would turn out, but things weren’t looking good. At this point, skipping school was the norm and teachers and administrators hardly noticed – and neither did my folks. They were too busy. My sister was in the process of dying from cancer, a lengthy ordeal. Understandably, my parents had a lot on their plates. They were simple people, lost in the complexities and ongoing tragedy of their firstborn’s steady decline. I imagine they knew I was floundering, but I was in those difficult adolescent years and I didn’t make it easy for them. Eventually my parents decided to send me to spend time in the country with a lady who worked in my dad’s dress factory. Then I met their son Marvin, who was in his late 30s. Soon he was someone I looked up to. Not only was he patient and happy to have me tag along with him, Marvin did a different kind of fishing – one where you cast a lure out and reel it back in. This was active and much more exciting. We would row over near the lily pads where the fish hung out. From there a well-placed cast could be rewarded with an explosive strike from a smallmouth bass. Pretty soon, I no longer fished with Ben and I became a regular at Marvin’s house. It’s been more than 60 years since I first met Marvin. 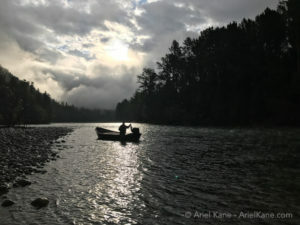 Since then, my passion for fishing has continued to grow and I have traveled to places beyond my wildest expectations. I have raised a family of my own. I’ve been married and divorced and married again – now for more than 30 years. Like Marvin, I am now a teacher. I never thought that was possible in those difficult years when I was so busy trying to figure out who I was and what my life purpose would be. In answer to your question, Marvin: Yes. I have become a mensch. I’ve come to realize that it is possible to be a mess as a child, yet grow up to make a difference in the world. Having a troubled childhood does not mean that this moment of my life can’t be satisfying, fulfilling and perfect. Especially when I take my attention off myself and take care of the people around me. Join us August 1/19, as we talk to Business Analyst Bill Baxter who will talk to us about the role of a BA and how they help the BCM/DR professional. There are times in your life when you simply must listen to your gut. When your instinct leads to an impulse to take a certain action that will change the course of your planned out trajectory for the better. For some people it leads them to find their soulmate. For others it leads to finding a lifelong hobby. For my business partner Sheila and I, talking about rejuvenating the “down down” lead to VoiceAmerica Internet Radio and we couldn’t be more excited! We will be launching our show Life: Flat to FABulous Wednesday March 6 at 3 pm Eastern time and thought we would share the fun video that got us here. We hope you enjoy our clip and be sure to grab a tasty beverage and #gabwithfab Wednesday afternoons! The lawn, browned from the hot summer and autumn, is once again a lush verdant emerald. Fresh new leaves are beginning to unfurl on plants presumed expired. Weeds are sprouting in every crevice and worms are back working their tilling magic. Tiny pink buds are exploding on peach trees, white blossoms already cover the flowering pears, and scarlet blooms of Chinese flowering quince, a member of the rose family highlight the barren landscape. We are smack in the middle of winter with the opportunity to learn, teach, and enjoy. As you drive along the local roads, you’ll witness fields carpeted in yellow. This is the wild mustard plant, the magical staple of my childhood. Every year in March our walnut orchards would be blanketed in five-foot tall plants that provided my siblings and me abundant opportunities to build forts, hide from our parents, and make mustard leaf sandwiches. We’d collect the seeds, mix them with vinegar and sea salt, and make our own culinary creations. Our Dad would eventually till this beneficial cover crop back into the soil as a green manure to add nitrogen, increase drainage, and water retention. If you planted seeds of edible greens and cool loving crops in the fall, you are now harvesting many members of the mustard family including cabbage, kale, collards, kohlrabi, broccoli, yellow mustard, bok choy, and cauliflower. Buds of Brussels sprouts are forming their “sprouts” in the axils of leaves on the stalk. Flavor improves with Brussels sprouts after two or more frosty nights. The mustard family includes the genus Brassica whereby most of the leaves and flowers taste peppery. Since the flower pattern is in the form of a cross, the plants are referred to as cruciferous. Called super-foods, cruciferous vegetables pack a punch with disease- fighting phytochemicals, attributed to preventing cancers and cardiovascular diseases. Brassicas are also nutrient and fiber-rich with healthy plant omega-3’s, vitamin A, C, E, B-1, and folic acid. They are easy to grow from seed in well-drained, fertile soil enriched with compost. Because Brassicas are prone to pests and soil-borne diseases, make sure to practice crop rotation and never compost the roots. Although you can use recycled containers to start seeds indoors in the winter, these plant varieties are more successful when seeds are sown directly in the garden. With the recent outbreaks of e.coli infections found in a variety of leafy greens and specifically romaine lettuce, growing your own vegetables is not only less expensive, but it is safer because you have the power to control what goes into your soil. Seeds of arugula, Swiss Chard, lettuces, spinach, scallions, sorrel, fennel, and nasturtium can be succession scattered to ensure year-round eating pleasure. Your vegetable garden has the potential to feed your family throughout all four seasons at a fraction of the cost of what you’d pay for equivalent produce at the market. In winter, you will rarely have to turn on a water source, and you can fertilize with your homemade compost. When you save the seeds of your favorite plants, you also won’t have to buy new seed packets. During every planting period consider adding an unfamiliar crop that you’ve discovered by perusing seed catalogs. Even when the inclement weather is keeping you bundled by the fire indoors with a cup of hot tea to ease your sore throat, if you’ve taken an hour or so to sow your favorite seeds, germination will be happening underground. One sunny day you’ll walk outside to witness the miracle of nature. Voila! Instant leafy greens sown and grown in your personal hearty-health home garden. PICK UP the fallen blooms of camellias to prevent the fungus Camellia blossom rot which causes blooms to turn brown from the center out. Do not compost spent blossoms. Put the dead blooms in the trash bin. USE Chinese flowering quince as a spiny hedge or barrier. DON’T mow your lawn after a rain when the soil is too moist or you will damage the grass and cause rivets in the soil. PLANT seedlings of celosia next month for a late spring show. FINAL time to heavy prune your roses. Dig canes in a rooting solution and plant in rich soil in small containers to give as summer hostess gifts. GROW your own Brassicas and leafy greens by sowing seeds in succession. MAKE homemade mustard from the seeds of wild mustard by grinding them and adding salt and vinegar. PRUNE and shape pelargoniums and geraniums for fuller flowering. WASH leaves of indoor plants that are dusty. Re-pot if necessary. FEED the birds as winter is challenging for them to find essential food. Cynthia Brian, The Goddess Gardener, raised in the vineyards of Napa County, is a New York Times best-selling author, actor, radio personality, speaker, media and writing coach as well as the Founder and Executive Director of Be the Star You Are1® 501 c3. Tune into Cynthia’s Radio show and order her books at www.StarStyleRadio.com. Buy a copy of her new books, Growing with the Goddess Gardener and Be the Star You Are! Millennials to Boomers at www.cynthiabrian.com/online-store. Hire Cynthia for projects, consults, and lectures.